Doris Duke Artist Awards Return, Breaking A Pledge To End After 5 Years The awards, which go to artists who have had significant impact in their field and who are likely to continue doing so, come with a substantial sum of money attached. 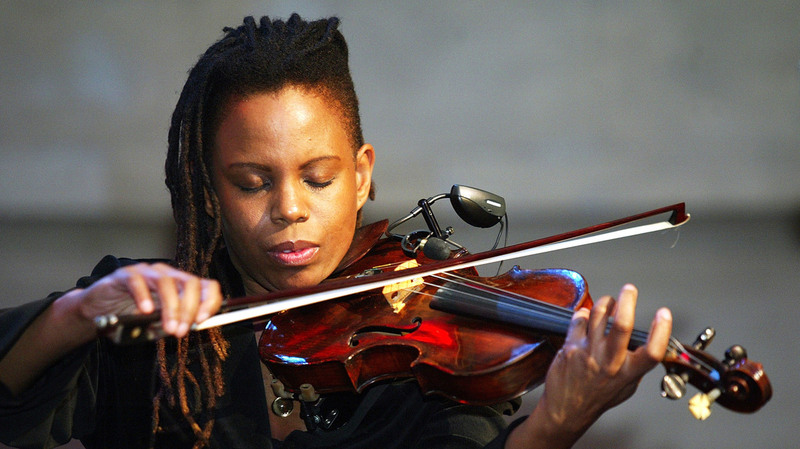 Violinist Regina Carter peforming. Carter is one of the recipients of the 2018 Doris Duke Artist Awards, along with Dee Dee Bridgewater and Stefon Harris, among others. But the success of the program in sustaining artists and nourishing the creative ecology turned out to be a persuasive argument for its survival. And so the Artist Awards have been resurrected as a core component of the Doris Duke Charitable Foundation's mission, with no expiration in sight this time. On Tuesday, the DDCF announced seven new Artist Award recipients for 2018, including singer Dee Dee Bridgewater, violinist Regina Carter and vibraphonist Stefon Harris. Awards were again also given in dance (Michelle Dorrance, Okwui Okpokwasili) and theater (Muriel Miguel, Rosalba Rolón). Each honoree is awarded $250,000 of unconditional funding, with an extra $25,000 to incentivize retirement planning. Carter was all the more honored to be named one of the first recipients in the wake of the Awards' renewal. "The fact that they could continue it," she says, "and the importance of them recognizing [the Awards' success] and finding a way to continue, not only for my sake but going forward — that news made it even more emotional." Past recipients in jazz include saxophonists Anthony Braxton, Henry Threadgill, Oliver Lake and Steve Coleman; trumpeters Wadada Leo Smith, Dave Douglas and Ambrose Akinmusire; and pianists Randy Weston, Fred Hersch, Myra Melford and Jason Moran. All of these artists, among others, have created ambitious and wide-ranging work in recent years. "If they didn't have the help of this award," says Carter, "maybe a given piece wouldn't have been heard, or they wouldn't have been able to take it on the road and really develop it. Or maybe they can afford to take a gig that they couldn't take before, a gig that's important to do, or a big help to someone else. So the Artist Award doesn't just help that particular artist. It helps many people." The most significant change, besides its continued existence, is that the recipients number far fewer than in the past, which will remain so going forward. "We're keeping it going despite the fact that it means we need to find the resources within our regular annual budget," says Maurine Knighton, program director for the arts at DDCF. "We were providing 20 awards every year for five years, but we knew we couldn't absorb that level of funding. It meant we had to scale back to up to six or seven a year, and it might be as few in a given year as three." In order to maximize available funds, the DDCF also chose to stop using a third-party administrator for the Artist Awards, bringing the day-to-day of the program in-house. "The wonderful outcome of that," Knighton says, "is that we're in direct and regular contact with the artists themselves, instead of having that mediated through a partner." Along with the smaller class of winners, the search process now involves nominators, reflecting a need, as Knighton describes it, "to open up our aperture in terms of who should be considered." In the past, she adds, "candidates were sourced through an internal formula for eligibility that included having already received a certain number of awards [as helping to make their case]. But we understand that there are different ways of achieving and recognizing success, and we also saw that we weren't the only experts about that either. We needed to rely on our colleagues in the field to help us identify those artists who are deserving." In this year's class, Bridgewater, an NEA Jazz Master, and Carter, a MacArthur Fellow, come with no lack of prior high-level recognition. For Harris that is less the case, though his nearly 20 years of richly varied output speaks for itself. While Knighton asserts that the criteria will remain unchanged, she acknowledges the nominators' ability to shake things up in salutary ways: "We don't have a specific intention to elevate emerging artists," she says, "but we try to make a pathway for artists at different career stages, so that they might rise to the list of finalists. This means having nominators and panelists who are also at various ages and career stages." The criteria center around "the impact the artist has already made, and the promise of continuing impact in the years to come," Knighton offers. "It's for artists who are very active — working artists who are thinking in creative ways, influencing their fellow musicians and composers, having an impact that in some ways has yet to be shown in full measure." An Artist Award, with its unrestricted support, can heighten that impact simply by "allowing artists to pursue the sort of life goals that the rest of us have," Knighton says, "whether that's sending a child to college, or owning a home, or engaging in exploration or travel. We want to recognize that artists are like everyone else and they deserve to be supported."